Humility is a tricky thing, let’s not mince words about it. You must take pride in all that you do, but you must never become ‘prideful’ or ‘conceited’. It’s a tightrope, with pitfalls on either side. Finding balance on that tightrope takes time, and practice, and most of all, it takes humility. 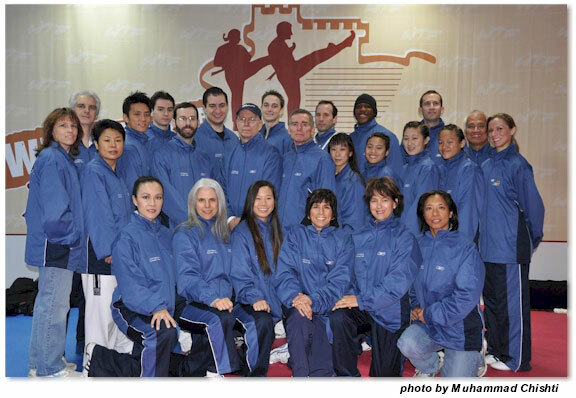 This image is the 2008 US National Tae Kwon Do Poomsea team. Amidst them is head coach Dr. Misha Thackrey. This story is about him so a little background is in order. Misha, is a Phd Professor of Psychology, a Diplomat for the American Board of Professional Psychology, a 6th degree black belt in Tae Kwon Do (exceedingly rare level), the Head Coach US National Taekwondo Poomsae Team, and a friend of mine for almost 20 years. Some 20 years older than myself, I’ve always looked up to Misha and regarded him as both friend and teacher. We’re from different martial arts families, but one element both our families share is a very high regard for humility. When we finished the floor he then said to me, “I’ve got some paperwork I need to do, you take care of the mirrors, and then we’ll have lunch?” I eagerly agreed, and started to clean all the fingerprints off the mirrors. There are a lot of mirrors at a martial arts academy! Cleaning a bathroom takes longer than making tea, so I finished before him and went to tell him the tea was ready. As I entered the bathroom, he didn’t see me, what I saw next I can still clearly see in my mind’s eye. When I walked in, he was literally on his back, on the floor, scrubbing the underside and back of the toilet tank! The bolts which secure the toilet to the ground, the tube running from the wall to the toilet, under, behind, inside, beside, the walls, the floors, the mirrors, the sinks, all with incredible speed and an attention to detail unlike any I had ever seen. It was a dance of perfect bliss and delight, an ecstatic meditation of bathroom cleaning. For me, I don’t like cleaning toilets, I admit it. Not my own, and certainly not a public toilet! But I’m not a Grandmaster… Check your own toilet, the underside, the pipes, the bolts, the base, are they spotless? There was no vanity in the act. It was pure humility, pure in the way we do things when we don’t know someone is watching. For me, it was Lesson Two in Humility, a defining moment for what I know understand Humility to be. He was simply cleaning the toilets as best he could clean them and taking great joy whilst doing it. Nothing more, nothing less. We all have things which must be done, and which we don’t particularly enjoy doing. For me, it was cleaning toilets, until I was finally put into my place by a master and finally learned to take pride in every thing I do. 1.If I were the perfect example of humility, what would be different in my life? That’s it for today! See you tomorrow!